Dishonored is an adventure game with an emphasis on stealth based gameplay. The game has fantasy type elements that give the player some very enjoyable abilities to use during their their assassination attempts. The game takes place in a fictional setting that is similar to London in the early 1900s and blends the industrial age with magical elements. Much of the game is set in the industrialised city known as Dunwall. Currently the rule of Dunwall is in the hands of an oppressive government who controls the town by killing citizens at will and through the use of heavily armoured soldiers that use large mechanical legs to get around. 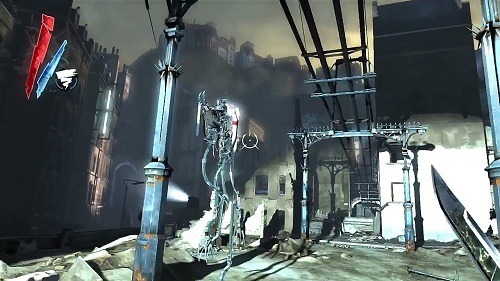 A plague also forms part of the story in Dishonored which turns the infected to violent humans who cry blood. 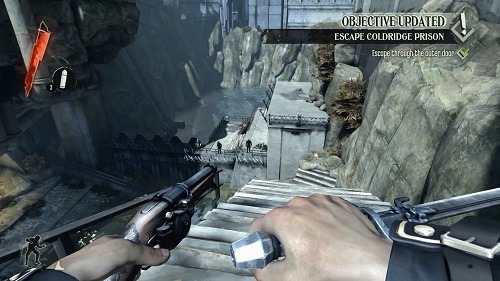 Players assume the role of the protagonist in a first person perspective through a series of missions which require the player to use everything at their disposal in order to achieve a successful assassination. Every mission lets players approach the game differently by either using stealth, direct combat or a mixture of both. An important part of completing these missions is the abilities available to the player which come in both active and passive forms and can be upgraded throughout the game. The most notable of these abilities is the blink mechanic that lets players teleport around the world and the possession ability which gives you control over creatures and humans. A very unique element of the game is that each mission has two versions. If players assume a more aggressive and lethal role they will increase their chaos rating which will mean future missions have more guards, some characters will refuse to help you and players will experience a different ending. In between your missions players can return to their main hub (the Hound Pits pub) where players can upgrade their weapons, stock up on ammo or healing potions and more. All of these cost gold which is earned through finding items in the game world (which when collected are turned into gold instantly so you won’t have to do any inventory management). Dishonored walks an interesting line between action and stealth based game with plenty of decisions left in the hands of the player. The difference between high and low chaos alone definitely warrants a second playthrough. A stealth based adventure game. Mixture of fantasy and industrialisation. Unique chaos rating system alters the levels and ending. Plenty of different approaches to each level. Customise your skills and equipment to your liking. Brilliant Game! Release date seems incorrect!